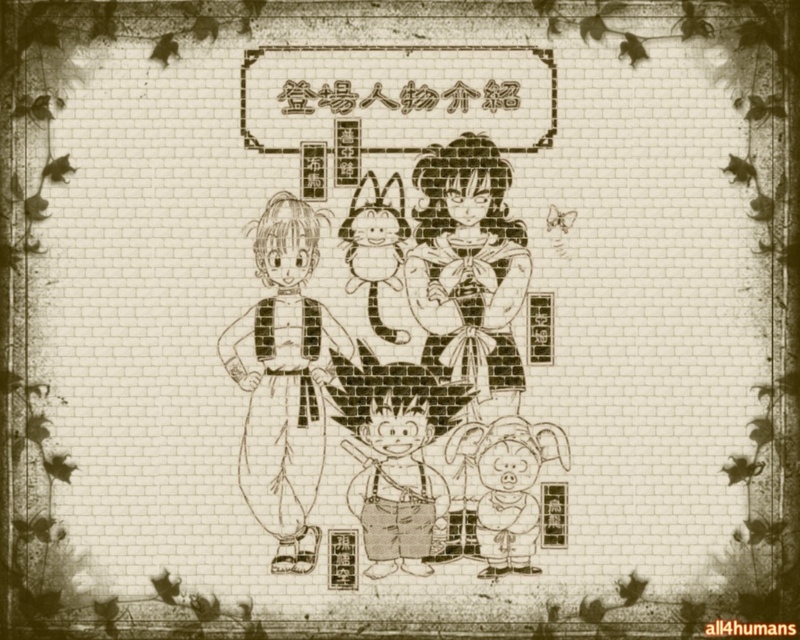 Finally I made my first wallpaper and I developed Dragon Ball wallpaper the reason for choosing Dragon Ball is that I like Dragon Ball series and I am a fan of it so I searched for the scans and I found the scan in ANIMEPAPER.net. I found the scan so adorable that I really wanted to come up with something simple and really wonderful but as expected I wasted a lot of time to come up with good idea as it was my first wallpaper. Finally I got an idea which was to make an old photo frame but I really wanted it to be different so I started over again and finally came up with this which I made it look like a painting on the wall. I used brick, grunge, and floral border brushes which I got it from devianart.com the brick brushes were created by libella but these brick brushes were too small so I modified them and made my own large brick brush and used them, thanks to libella and the other brushes authors. I dedicate this wallie to my brother, all the anime fans and offcourse to MINITOKYO.net for allowing me to download wallpapers. Software used: "The Gimp" software which comes with linux operating system. I hope you people like it!. I'll be glad to see your comments. ENJOY! This gave me an image of those old photos hanging in my granny's home. An interesting idea, coming from and old anime show. Yay, I like very much the first series of Dragon Ball, and it's good to see wallpapers of it ;) And this is a cute one.